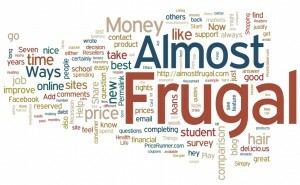 Almost Frugal is a blog about learning to manage our money in a way that helps us meet our goals. For us, being frugal doesn’t mean deprivation, it means being smart with your spending, saving and money goals. That may look like a number of things- something different to every person- so we try to have as diverse a perspective as possible. While Almost Frugal started out as the story of one woman’s journey towards financial independence (or even just being able to pay the bills on time), we are now a group blog, bringing together the voices of five writers: four women and one man. We talk about learning to live with a budget, our relationships with money, trying to feed our family for less, still living the good life and so much more- anything and everything related to frugality and personal finance, from our diverse personal points of views: mothers, fathers and family, teachers and consultants, believers and not, in the United States and in France. But above all, we think of Almost Frugal as a community. Because learning about personal finance is easier when you are with friends, join us as we journey towards frugality together, sharing tips, tricks and support along the way. We warmly welcome comments (though if you wouldn’t say it in front of your mother, don’t say it here) or guest posts. We also have two weekly posts that feature our readers: the series This is What Frugal Looks Like, which offers a look at the way different people experience frugality and Tell Us Tuesday, a share and tell post often inspired by reader questions. You can also follow us on Twitter or become a fan of our Facebook page. If you’d like to participate in either of these series, or contribute a guest post on any subject related to personal finance, frugality and budgeting, then just drop us a line. Join us on our journey, and, as always, thank you for reading along!